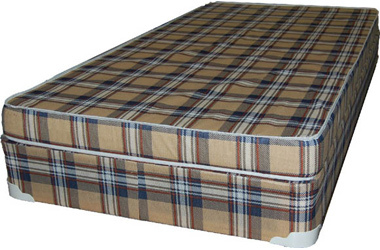 A Very low cost mattress, Made of 4 inches of polyurethane foam covered in smooth plaid. Optional matching foundation box. This is the cheapest mattress we carry. This is a great mattress for temporary usage at home or in a RV Motor Home. They can be custom ordered to any size to fit. The Poly Foam mattress can also work good on a bunk bed but only if you give it a solid foundation to rest on. Contact Michigan Discount Mattress about ordering a bunkie board. If you plan to use the bed for more than a week at a time, I would suggest upgrading to the Hotel Motel or the 6" Foam mattress for extra comfort. Links Copyright © 2005-2011 www.MichiganDiscountMattress.com. All rights reserved.